Permission forms due Wednesday, February 27th, 3:45 PM. There is no cost for this activity, but students will miss class this day. Our school has been specially invited to bring any and all leadership-related students (STUCO, Super SAC, NJHS, Leadership Class) due to our national showcase school nomination for "Capturing Kid's Hearts". LeadWorthy Live brings student leaders to a stadium-sized classroom to learn, be inspired and challenged to #BEREMARKABLE! 15 service hours from summer to Christmas break should be turned in. They can be turned in online using the form on our club website under the service hours link or by printing the form on that link and turning in by hand to Mr. Mayes. All members become a friend on our club Facebook page/ "SMS National Junior Honor Society"
At the end of April of the 7th-grade year, candidates are invited to join NJHS. In order to receive an invitation, you must meet the Scholarship (maintained a 90% average for all your classes/electives, an 80% average for all Pre-AP/Advanced classes, for the 1st - 5th six-week grading periods) and Character requirements (never received ISS and maintained a 90 or above in conduct for the 1st - 5th six-week grading periods). After meeting these first two requirements, students who qualify will then be evaluated by each of their teachers using a 0-5 scale in each of the following areas: citizenship, service, leadership, character. Students who have a 16 average or higher will be inducted into the National Junior Honor Society. Please Note: Grades alone do not guarantee membership in NJHS. Each student must also have a 16 average or higher from the teachers and staff to become a member. 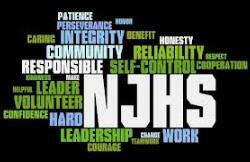 Official membership into the SMS NJHS happens when you pay your $15 dues and attend the Induction Ceremony in May. Until this ceremony and after this ceremony, you are expected to continually uphold the qualities of an NJHS member which are: Scholarship, Character, Service, Leadership, and Citizenship.